My friend Janet asked me to make her cheesy kale chips. I will admit I’ve seen them around for a while now and thought meh…maybe one day. Then Janet bought me a bag of the cheesy kale chips at Whole Foods. I tried them and was wowed. So I finally made kale chips today. Put cashews, red bell pepper, lemon, nutritional yeast and 1 t. Celtic salt in food processor. Blend until smooth. Using your hands, massage coating onto kale pieces getting it inside of curls. Put on baking sheets sprayed with cooking spray. (Don’t worry about flattening them, they’re better bunched up) and cook for 2 1/2 to 3 hours. Flipping halfway through. ***Updated to add: we now have a dehydrator and it makes these a lot easier. Follow directions above and place them on dehydrator trays and let them go for about 4-5 hours (or until desired crispness) rotating the trays halfway through. You should try nutritional yeast! I didn’t think I would like it but now I LOVE it! It has such a good nutty flavor! I’ve made plain kale chips before and they only took about 20 minutes — I don’t know if I could wait for 3 hours for those! Latest trendy things I’ve tried — I try all of the blog trendy stuff — overnight oats, oats in a jar, using peanut flour, etc. Nothing too fancy or crazy. Kale chips are surprisingly good eh? I make them on occasion, and always enjoy them. Those make me realllly nervous. I’m not good about branching out with foods but I might try them! Hmmm…so you use the yeast instead of cheese? Any reason? I am sure real cheese would work but I just followed that raw recipe because it most closely matched the ingredients on the back of that bag from Whole Foods and they were vegan. 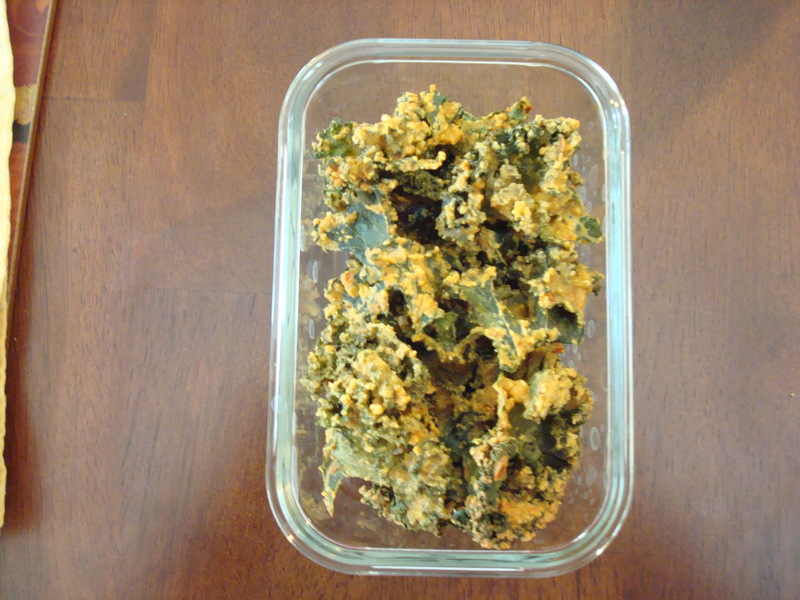 The last time I made cheezy kale chips, I seriously almost made myself SICK off of them, I ate so many!!! I just couldn’t stop!! Um yeah…they are insanely addicting. I am not making more anytime soon! ha! Too much effort for the amout of time they actually last. I tried to make regular kale chips once and I think I left them in the oven too long because they literally disintegrated when I picked them up. Yours look much better. I think first I’ll have to try the Whole Foods ones, mainly because I don’t have a food processor and I’m not sure what I’d coat them with if not that mixture. I have been wanting to make these for awhile. This recipe looks so easy too! I made these about a year ago and I concur – they are good, but for the amount of effort, not worth it. I think I’d need to make them in SERIOUS bulk. I used a dehydrator, but mine didn’t stay crispy. Have you tried them with a different nut other than cashews? I’m making these TODAY and I’m so excited about them. My husband my kids and I love the Whole Foods brand which also includes Chia seeds. I had posted a question about nutritional yeast, I researched a bit and figured it out. Have you tried using a different nut other than cashews? Thanks for the recipe!